ALthough the picture might be small, the tour is quite mighty. Expect to see them all over the USA and i’ll shall be extending their tour visit with some hopeful festival appearances in eastcoast and SOuth East and midwest yes dates. think north carolina, south carolina, tennessee, virginia, maryland, dc and more. Also, will we see them at this year’s A3C Festival in Atlanta or the CMJ?? 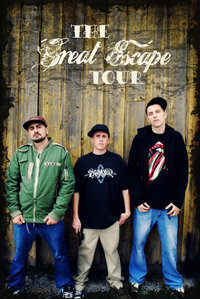 these guys are the next big thing to come out the southwest west coast area. They cross between some east coast grind and living legends aesthethics, with the work force of a indie rock band on the road 180 days a year. With that being said, make sure you hit a show. check the dates here.